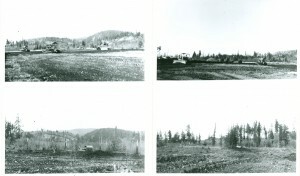 Roy Swanson provided these pictures of the local loggers clearing the land and building the Swanson airport. Roy believes the pictures were originally Bud Blancher’s. All the men volunteered their machines and time. Even more astounding, the 1,850 runway took them just a little over two weeks to build.